Light aids vision, improves appearance, creates a mood and gives a sensation of well-being. Create special effects, ambiance and beauty with CLIPSO® lightboxes. CLIPSO has various aluminum profiles that are ideal for lightboxes. These profiles are sturdy, durable and allow space for integrated lighting. See the CLIPSO range of profiles here. CLIPSO translucent fabric is available in 30%, 50% and 70% translucency. 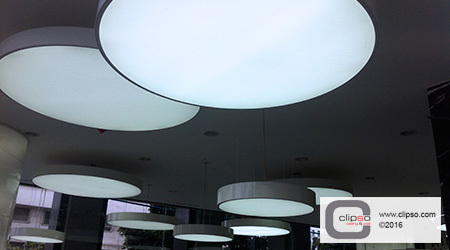 CLIPSO also offers an acoustic translucent fabric available at 40% translucency. You can choose a lower translucency if you are looking for a design element and a higher translucency if you are creating functioning light for a room. There are several lighting optionsavailable including various LED options and fluorescent lighting. The most popular option available for lightboxes is LED module lighting (CLED3). When positioned properly, CLED3 lighting modules provide an even light flow, casting no shadows or hot spots in lightboxes up to 16’ x 16’! Most CLIPSO aluminum profiles can be bent into custom shapes to your specifications. The possibilities for shaped lightboxes are truly endless. Using a custom print in a lightbox adds style and appeal. Illuminated totems or wall frames, with easily replaceable signage, are essential in the retail industry.